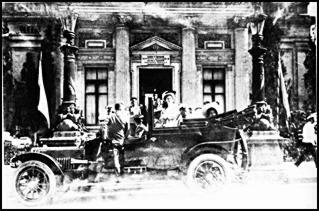 Above: The Imperial Family in front of the Imperial Garage at Livadia on "White Flower Festival" day in 1913. Left is an early Delaunay-Belleville ca 1910, right is a Rolls Royce Silver Ghost, one of two Rolls the Tsar owned at Livadia. According to Lt. General A.A. Mossolov, Manager of the Office of the Imperial Court from 1900 to 1917, it was Prince Vladimir Orlov who first drove up to the Alexander Palace in "a very smart car" in 1903. The Tsar was intrigued, and wished to go for a drive in "this kerosene thing". After his first turn around the grounds, Nicholas invited the Tsarina to join them. The Tsar went for a drive with Orlov almost every day after that. Fearing for the life of the Tsar, Orlov insisted on driving himself, never trusting his Imperial passengers to a mere chauffeur. The Prince served as the daily "chauffeur" himself. Eventually, Nicholas' Minister, Count Fredericks asked the Tsar if he wanted to acquire a new and improved motorcar. The Tsar responded quickly: "Yes, of course!. We are abusing Orlov's kindness and it is becoming impolite. Ask Orlov to choose a motor car for us, he can do it better than any professional." So, after more than two years, Orlov chose a French 1906 Delauney-Belleville. Thus began the Imperial love affair with automobiles. Above: This image from 1915 shows Nicholas II reviewing a Cossack regiment during the First World War. Behind him is a Mercedes Limousine from the Imperial Garage. 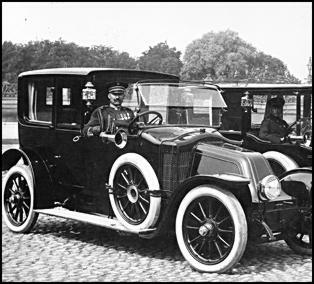 While the French Delaunay-Belleville was the Tsar's choice for short trips and in town use, for long trips he preferred the sheer speed of the German built Mercedes cars. During the period prior to 1914, Mercedes' reputation was world-acclaimed for the incredible power and speed of their cars. The 90 horsepower touring car was capable of sustained speeds at 85 mph as early as 1904. Orlov, however, insisted on driving the Tsar himself, despite the opening of an Imperial Chauffeur school, until a French Driver with most impeccable references could be brought to Tsarskoe Selo. 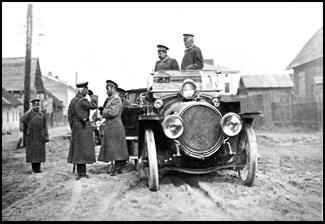 Even still, Orlov insisted upon sitting next to the Imperial Driver when he drove the Tsar for inspections. Left: This 1912 photograph taken at the Alexander III Museum in St. Petersburg shows Nicholas II and several Grand Duchesses in the back of one of the 1909 Delaunay-Belleville "S.I.M." long wheel base Touring Cars. 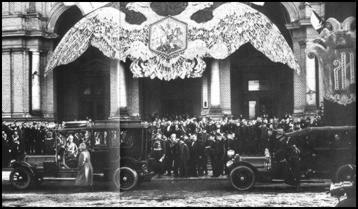 The Imperial Personal Garages were established in 1905 in Tsarskoe Selo and Peterhof. By the end of 1906, there were 6 cars in the Garage, kept at a cost of 100,000 roubles - the equivalent of $1,000,000 in 2000. In 1905, the Imperial Household spent 18,400 roubles to buy its first new cars, $184,000 in 2000 terms. Clearly, Nicholas II enjoyed his new cars, as indicated by the amounts he spent just to acquire them over the next few years. In 1906, the Tsar spent 77, 277 roubles or $727,000. He spent 69,700 roubles in 1908 ($697,000), 65,000 roubles ($650,000) in 1909, only 33,000 roubles ($330,000) in 1910, a record 96,681 roubles ($966,810) in 1911, and 58,600 ($586,000) in 1912! Garages were also established at the Winter Palace in St. Petersburg, and at Livadia Palace in the Crimea. Above: Tsarevitch Aleksey Nicholaevich, in 1909, sitting behind the wheel of a French made Delaunay-Belleville touring car. 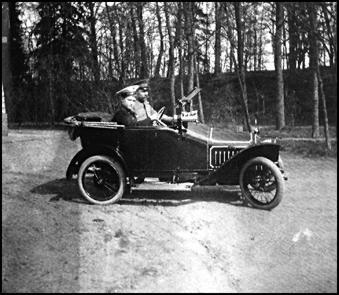 Delaunay-Belleville was the Tsar's favorite car. The List of Automobiles in His Majesty's Personal Garage in 1910. There were 21 drivers,1 driver for each motor-car, and a budget of 126,000 roubles ($1,260,000 today) to maintain the garage for the year. 1 1911 Mercedes 4 cyl. 70 HP "Landau"
2 1911 Mercedes 4 cyl. 70 HP "Phaetons"
2 1911 Delaunay-Belleville 6 cyl. 45 HP "Landaus"
2 1912 Delaunay-Belleville 6 cyl. 45 HP "Phaetons"
a 1910 Serex 40 HP Landau and a 1911 Mercedes 4 cyl. 70 HP Landau. Right: This photo was taken at the Front sometime during World War I. Nicholas has just gotten out of another of the 1909 Delaunay-Belleville "S.I.M." open Touring Cars. Note the boiler shape of the engine compartment, a distinct reminder of the Delaunay-Belleville company's 19th century roots as a maker of Boilers and Locomotives. Of course, when the Tsar went for a drive, there would always have to be another vehicle following, in case the Tsar's car broke down. Right: This image shows Nicholas about to enter one of the Delaunay-Bellville Town Cars from the Imperial Garage, just behind the Grand Duchesses. The Town Car limousine is distinguished by the fixed divider just behind the Chauffeur, as opposed to the completely open Touring Car. It is interesting to note that both Imperial versions, though, have a lowerable canvas roof for the passengers to enjoy fine weather. 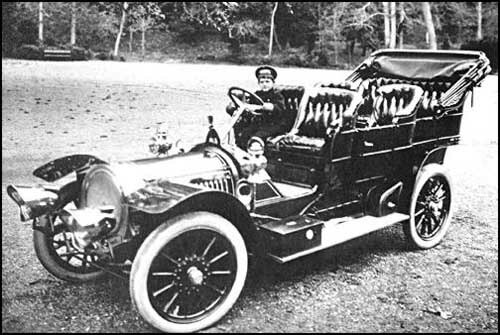 Nicholas II's most preferred automobile was the Delaunay-Belleville. Delaunay-Belleville was a large French manufacturer of boilers and locomotives during the 19th century. In 1904, they produced their first automobile. By 1907, the quality, power and reliability of their hand-built limousines came to the attention of the Tsar, who was impressed by their power and quiet. In 1909, they produced a special version for the Tsar, which they labelled "S.I.M." for "Sa Imperiale Majeste" (His Imperial Majesty). The "S.I.M." version was a longer wheel base model, equipped with a more powerful 6 cylinder engine whose huge 11.5 liter displacement produced a then impressive 70 horsepower. Curiously, however, it remained chain driven at a time when most other European car makers had already adopted a more "modern" shaft drive. The Imperial patronage was highly prestigious for Delaunay-Bellville, who were, as a result, considered the finest luxury automobile maker in Europe until the outbreak of the first World War. This reputation survived the war, and they continued to produce hand built, luxury vehicles through the 1920's. The Depression and Second World War, however, took their tool and the last Delaunay-Belleville was produced in 1948. The company's legacy, though, is that its true "Golden Age" was the period of 1907-14, when they were the favorite of the Tsar. >"Owing to the fact that the number of automobiles grows, His Majesty's Personal Garage petitions for the construction of a second stone building for the garage in Tsarskoe Selo, a new building in Peterhof and the construction of a garage building in St.Petersburg. Taking a considerable part of the budget of the Ministry of the Court and yet still continuing to increase its expenses, this automobile managing business does not yet have a definite position as yet, and the requirements which it must meet are not yet clear. Whereas His Majesty's Personal Garage is meant exclusively to serve the needs of Their Majesties and their Imperial children, the role and the importance of the garage can be defined only by Their Majesties' instructions. Given the circumstances it would be reasonable to stop the unfounded acquisition of new motor-cars in great numbers. 30 automobiles seems to be too many, taking into consideration the fact that, only once a year (besides serving the Emperor and his suite), the Garage uses all its vehicles � and then only during the manoeuvres in Krasnoe Selo which last 5-6 days. In the current year the garage had the needed number of automobiles it required, and rented only 4 and then only because the same number of its own cars had been sent abroad. In conclusion we must observe that serving Their Majesties and their Imperial children, as well as their suite, during the whole year is a new item of expense in the budget since it had been already fixed and it currently exceeds its balance. The increase of the number of automobiles to the supposed 30 and the construction of the new garage buildings with the required new staff will make His Majesty's present-day garage a large enterprise which will be a heavy burden on the Ministry's budget." Left: This photo shows that even the Tsarevitch Aleksey Nicholaevich would join in his father's passion for automobiles. Here Aleksey is driving his father in a fully functional child-size Peugot BeBe gasoline-powered car, designed by Ettore Bugatti for Peugot, given to the Tsarevich as a gift from his parents in 1913. 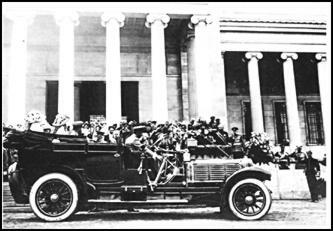 This car would remain in the Alexander Palace after the Revolution and can be seen in photographs of the Mountain Hall, next to the the "Slide"
Nicholas loved his cars, though, and as they quickly had become an essential part of Court life, the expenses were approved. Nicholas' problems with the Garage went beyond the complaints of the Ministry, about paying for his purchases of new cars. Staffing and maintenance presented their own problems. There were, of course, no dealership service departments or automobile repair shops in Russia before the First World War. Drivers were required to repair and service their vehicles as well as drive them. Since automobiles were new to Russia, the Imperial Chauffeur School had to train the men to be able to repair and maintain their cars as well as drive, since virtually no one in Russia in 1905 could do either!. Driving the members of the Imperial Family and the Court also would require more than mere ordinary driving. As the photos show, many of the Imperial Family's cars were completely open, which could present a danger to the Tsar or members of his family. The driver, would, naturally be required to look out for and avoid any potential threats to his passengers and would have to be able to elude a potential assassin. A lesson was learned once when Professor Gilliard and the Tsarevich were stuck in an early traffic jam in the streets of St. Petersburg in an open car. When the people on the street saw the Heir to the Throne in the car he was mobbed by hundreds of people at once. Of course, there were very few trained Chauffeurs in Europe at that time, and certainly none in Russia, so they had to be trained in these skills as well. Of course, the men were well rewarded for their positions, earning twice the average pay of a worker in those days in addition to free rooms and meals at the Palace. Their value to the Court can be seen in the following passage. "The salaries of the workers of the garage are now as follows: the drivers of the Imperial cars get 90-100 roubles ($900- $1,000) and other workers 50-80 ($500-800 in 2000) roubles a month. But Your Highness should be aware of the fact that even in private houses it costs much more than that to keep the drivers to say nothing of the profit the hosts get from different kinds of stuff they are supplied with which is usually of little use to the workers of the garage who live there. The work in the garage cannot be called easy - it does not stop even on holidays and they often have to work late hours at nights and even through the nights to be in time to finish the current repairs to supply Their Majesties and their suite with motor-cars. At the present moment, owing to the constant fault-finding of the Controlling Commission, the Head of the Mechanical Department of the Garage, Kegress and his assistant must listen to numerous reprimands and claims which surely makes the work of the employees much less efficient. Under the circumstances Kegress has lately asked me several times for the permission to retire. ... I consider Kegress an irreplaceable worker and I am afraid his leaving will be a great loss for the garage. Your Highness knows, of course, how much His Majesty appreciates Kegress." (Further in his letter the Prince asks the Minister to order the Controlling Commission not to meddle with the problems concerning the workers' payments and to leave them in the management of the person in charge). The Report of the Temporary Acting Manager of the Ministry of the Court on the Approval of the Style of the Uniform for the Employees of His Majesty's Personal Garage" made on October 20, 1907. The managers of the Mechanical and Economic Departments of Your Majesty's Personal Garage as well as the lower staff like drivers (6 men), mechanics (7 men), washers (9 men) do not as yet have approved uniforms. Last autumn the Aide-de-camp Prince Orlov presented to Her Majesty Alexandra Fyodorovna certain patterns of the uniforms for the drivers and Her Majesty expressed her wish for the uniforms to be modest enough so as not to attract much attention. Then, on the expense of Your Majesty's Cabinet, they made the uniforms for the drivers which appeared to be not very practical when used (the color of the braid, the style of the collar, etc.). To proceed from everything said above and from the necessity for all the above-mentioned staff of the garage to have their uniforms, the management of the garage worked out their own specimen uniforms according to the instructions given by the Aide-de-camp Prince Orlov." What it boiled down to, was that Empress Alexandra wanted the men to wear court livery-style uniforms, with high collars, fancy hats, and colored braids, which the drivers hated. Wearing these uniforms made the drivers look like palace servants, a position that was generallly despised at the time. They were quite proud of their jobs, as highly skilled and trained men of no small job responsibility. As a result, the drivers wanted a military-style uniform, which they felt was more suited to their postion. "Uniforms of the Workers of His Majesty's Personal Garage (1910). Chauffeurs driving the Imperial and the gentlemen of the Suite's motor-cars had khaki-coloured winter diagonal(a sort of fabric) full-dress uniform with a gold braid around the collar stamped with the coat of arms and a flannelette lining. Wide trousers of the same fabric. Two working uniforms and a peaked cap of blue Swedish moleskin. Patent-leather high boots; black tovar (?) boots. Yuft gloves; yuft fur-lined mittens. Khaki-coloured winter diagonal autumn coat with gold stamped button-holes on a beaver collar. Khaki-coloured cashmere jacket with a gold braid stamped with coat of arms and a red bow. Khaki-coloured cashmere peaked cap with a crown. Khaki-coloured winter diagonal coat sheep-fur lined with a gray sheep fur collar with a stamped braid on the cuffs. Grey vincord (a sort of fabric) uniform; blue Swedish moleskin wide trousers and a peaked cap; a suit made of the similar moleskin. Black tovar high boots; yuft gloves; yuft fur-lined mittens. Grey vincord coat beaver fur-lined. Grey cloth summer jacket bordered with a red braid. Grey cloth wide trousers; peaked cap of the similar cloth. Grey English vincord winter coat with a black astrakhan fur-collar. Grey English vincord fur-lined wide trousers with an edging. The uniforms were all made at Lidval's. Lidval was a supplier of His Majesty's Imperial Court. Minister Fredericks uniforms are exactly like those of a military officer of the time. Examples of these uniforms can be seen in this photograph of Renault automobiles in Palace Square from 1910. While the cars themselves are not from the Imperial Garages, the Chauffeurs' uniforms are those of the Imperial drivers. Native American Ancestry - Am I descended from Pochahontas? My dad's Sullivan family ancestors were descendants of the famous Powhatan "princess". This blog posting will help you find out if you are descended from her, too. Learn about DNA.